Please go ahead and use any of the banners below. Now that you are a registered affiliate, we have created a special code with your affiliate ID, so that you can upload the banners straight onto your website without worrying about adding the tracking information. We have two banners that work best, and will be increasing the designs very soon. 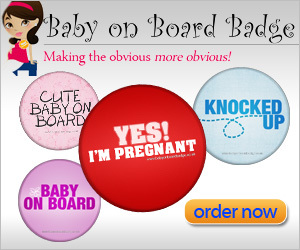 You may also like to use this Is it a belly or a baby to gets some facts about the baby on board badges, our tote bag range, and to explain to your readers why pregnant women should be offered a seat on public transport.